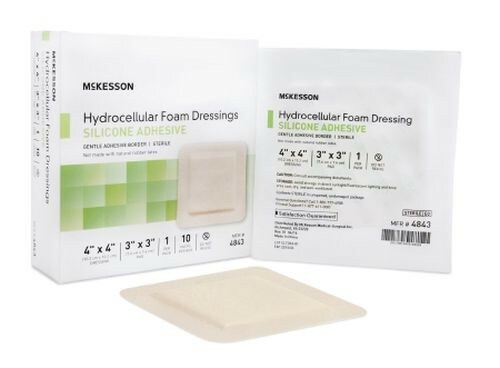 Adhesive Foam Dressings by McKesson are highly comfortable silicone adhesive that acts as a primary or secondary dressing for wounds with moderate exudate. The perforated, soft silicone gel adhesive provides gentle, but firm, adhesion while helping to minimizes pain and trauma to the wound and skin upon removal. The Adhesive Foam Dressing is formulated to be able to withstand lifting and repositioning without losing any of its adherent properties. Adhesive Foam Dressings are breathable while still remaining resistant to bacteria and moisture due to the outer film layer that firmly seals the wound margins. 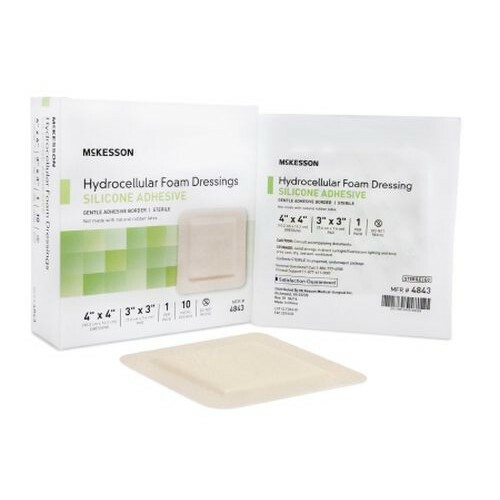 The absorbent inner hydrocellular foam pad maintains a moist wound environment to help promote healing making the Adhesive Foam Dressing an excellent choice for maintaining fragile skin. Vitality Medical also carries other items that would pair well with the Adhesive Foam Dressings, such as Skin Prep Wipes by Kendall and Betadine Povidone Iodine Swabsticks and Pads. Affixes Securely to Dry, Intact Skin; Seals the Skin Margins to Help Prevent Exudate From Leaking On Surrounding Tissue, Minimizing Risk of Maceration.